With Youtube TV available nationally, the service is sure to give Hulu Live TV, Sling TV, and PlayStation VUE a run for their money. YouTube TV offers nearly all your favorite pay TV networks. Subscribers will have access to channels like AMC, USA, Bravo, and much more. All you will need is stand-alone home internet service and you can watch TV over your internet connection. Furthermore, subscribers will have major broadcast networks (ABC, FOX, NBC, CBS, and CW) live through the service. While all these local networks are available. A few locations may offer certain networks “on-demand only.” This Google Help page outlines what to expect for each channel in a given area. In addition to broadcast numerous cable TV networks, YouTube TV includes a Personal Cloud DVR and YouTube Red original series. All this costs subscribers just $49.99 a month for six accounts. A single subscription can be used by six Google accounts, but will only provide three simultaneous streams. This comes with the benefit of hiding your viewing habits from others that share your subscription. As previously stated, the service will provide live access to ABC, NBC, FOX, and CBS. The CW will also come with the service. However, the service really starts to shine when it comes to sports. Having local broadcast networks will already provide plenty of live sports. Furthermore YouTube TV provides the following channels: AMC, BBC America , BBC World News, Big Ten Network, Bravo, CBS Sports Network, SNY, CNBC, Disney Channel, Disney Junior, Disney XD, E!, ESPN, ESPN2, ESPNU, ESPNews, FOX Business, FOX News, Freeform, Fox Sports 1, Fox Sports 2, FX, FXM, FXX, Golf Channel, IFC, MSNBC, NBCSN, Nat Geo, Nat Geo Wild, Newsy, Olympic Channel, Oxygen, Pop, SEC Network, Sundance TV, Syfy, Telemundo, Tennis Channel, Universal Kids, Universo , USA, YouTube Red Originals, Cheddar, Weather Channel Local Now, Adult Swim, Cartoon Network, CNN, Comet, HLN, TBS, TCM, TNT, truTV, Turner Classic Movies, MLB Network, NBA TV, Tastemade, TYT Network, Discovery Channel, HGTV, Food Network, TLC, Investigation Discovery, Animal Planet, Travel Channel, MotorTrend, and WE tv. The image below shows all the channels available. However, some regional channels will only be available if you live in that market. YouTube TV also offers Fox Soccer Plus, NBA League Pass, Starz, Showtime, and more as add-on channels. If you don’t see your favorite channel on the list YouTube TV will let you suggest they add it using their channel request form. 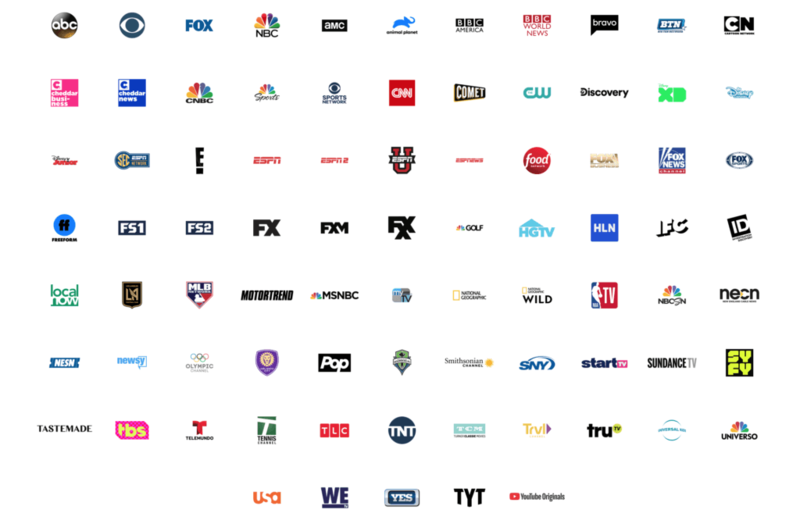 To find which channels are available through YouTube TV in your area, click the free trial on their website and enter your zip-code. YouTube has already been delivering video over the internet for years, so I would expect YouTube TV to have quality at launch. However, Google will support users through text and voice chat over the YouTube TV app. Subscribers will be able to watch three streams simultaneously. The service also includes a personal cloud-based DVR for each of the subscription’s 6 account profiles. In addition, the DVR provides unlimited storage and simultaneous recordings. Furthermore, your recordings are available for nine months. YouTube TV is available on Roku, Android, iOS (includes AirPlay to Apple TV), and Chromecasts/Chromecast-compatible TVs.